The flowers remain on the dining room table, as fresh as the day they arrived. The table, however, is empty where there was, only days ago, a cornucopia of never-ending goodies. The best part about the Malloff reunion (Mom’s side of the family) is the arrival of the clan and everything afterwards. The worst part is when they leave. I get the sense of what it feels like to be “empty-nesters”. Yuck. Leaving Auntie Helen, Mom’s sister, at Toronto International today was like losing Mom again. The two could not be more different – nor could they be more alike. Nonetheless, it was our clan’s matriarch, Auntie Helen, who brought everyone from across Canada and the US to celebrate our family. This reunion happens once a year but this year was the first when neither my Mom nor Dad were in attendance. Well, at least they weren’t here physically. The were certainly here in spirit and we never once forgot that. The day before she left I took Auntie Helen to visit Mom and Dad’s final resting spot. It was then when Auntie Helen said good-bye to her sister and life-long friend. She gave a kiss to each name mounted on the outside of the niche housing their remains. Time stood still. She asked for some time alone and I could hear her talking once again to Mom and Dad. It was her time for closure. Each person has to have closure and each in his/her own time. My son David and I sat on the bench by the main path and an older gentlemen must have caught us wiping away each others’ tears as he kindly offered us some flowers to give to whoever it was we were visiting. He didn’t know. Our tears were not for our loss – but for Auntie Helen’s loss. I remember how difficult it was to see Dad grieve the loss of his bride of 61 years. And that was tougher to take than it was for me to even lose Mom. This was no different. I can only imagine how painful it must be to lose a sister that you have know for 84 years. Actually, I can’t. But I do know that Auntie Helen mourned in peace and with grace and dignity. She placed a carnation for Dad and a white rose for Mom. Dignity. She wished them, “good-bye”. Dignity. We then went to visit the old property where the owner graciously invited us in to tour the home. There had been many renovations completed and in spite of the changes, the spirit of the old place still seemed to be there. Tina, the new owner, invited us to go back into the woods if we liked. So we did. Slowly, we moved through the bush and reminisced about each nook and cranny. Auntie Helen had been there so often, she knew it just as well as I did. Through the woods and around the corner – there it was… her names-sake, “Helen’s Mountain”. It really was a very tiny incline no more than 2 metres – and very gradual. But this mountain had been a challenge for Auntie Helen years ago during her virgin voyage on cross-country skis. She was terrified of the incline – which was a decline from her original approach. She took off her skis and walked down the slope. Well, the story was told so often about this scary spot that it eventually had to be re-named, “Helen’s Mountain.”. I asked Auntie Helen if she wanted to tackle that mountain one more time. She jumped at the opportunity – and so, with cane in hand on one side, and my son David on the other, she approached the mountain, walked half-way up, turned and posed for a photo. She did it. One fear conquered. We climbed back into the car and made our way home after a stop at Brown’s Farm and once more to Mom and Dad’s condo. I guess each of us has a mountain to climb and Helen, during this family reunion not only tackled one, but she tackled yet another – the loss of her sister and brother-in-law who were my Mom and Dad. How did she do it? Well, it certainly was not tackled while she was on her own. The mountains Auntie Helen climbed this past week were climbed hand-in-hand with family – family of both past and present. Family reunions & the time we spend with our loved ones are priceless. Departures are never easy. A touching story. Thanks for sharing. Wish I could focus more on the arrival – it’s so much more optimistic. Anyhow – thanks for the feed-back. Really? Thanks, WIlma. I’m so pleased that you find my stories – our stories – helpful. Thanks for your comments! A beautiful reminiscence. Thank you for sharing. If only I could capture the “experience” in words… I envy musicians. Thank-you Laurie for reading. I am so sorry that I missed getting over to see Helen while she was here. I know the mountain very well and glad she was able to climb it with her cane and helper ! Send her my love and will see her next visit. You bet, Martin! And you know how formidable the “mountain is”! Grin. This was certainly heart written and heart felt. YOur parents must be so proud of you. Well – I hope so – and thank-you. 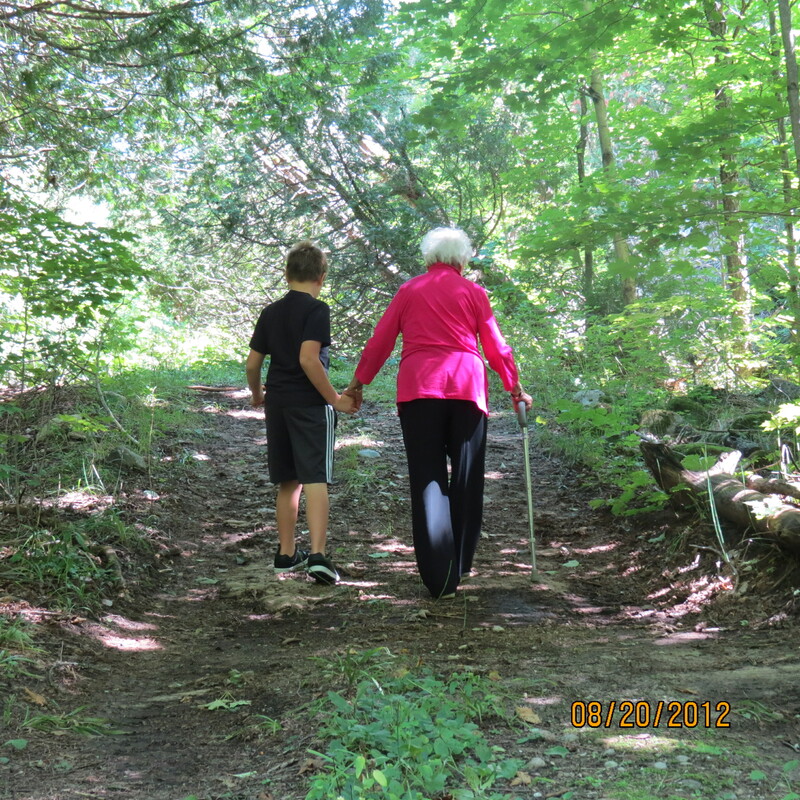 Almost two years ago now – and Auntie Helen is still going strong and climbing her mountains. It was fun to write, too! It’s great for you to have fun in writing. What a lovely, lovely post. Thank you. Oh, thank-you, Cynthia for reading it. It was an event that touched my heart so deeply. I was so pleased to see that, nearly two years later, I had recorded those thoughts as they would have been lost in the detail, no doubt. I loved my Auntie Helen – she was a very special person – I guess we all have an aunt like that! I appreciate that you took time to learn about her today.